Mini chalet is located on the slopes of Etna, among unspoiled nature and under the shadow of majestic chestnut trees, a short distance from Catania and the beautiful Taormina. It consists of a kitchenette, living / dining room, a bathroom, sleeping area, laundry and free indoor parking. It is furnished and equipped, equipped with various appliances (TV, washing machine, fridge, air conditioning, pots and pans, etc. ), also under the shade of chestnut trees there is a barbecue and an area equipped for outdoor meals. 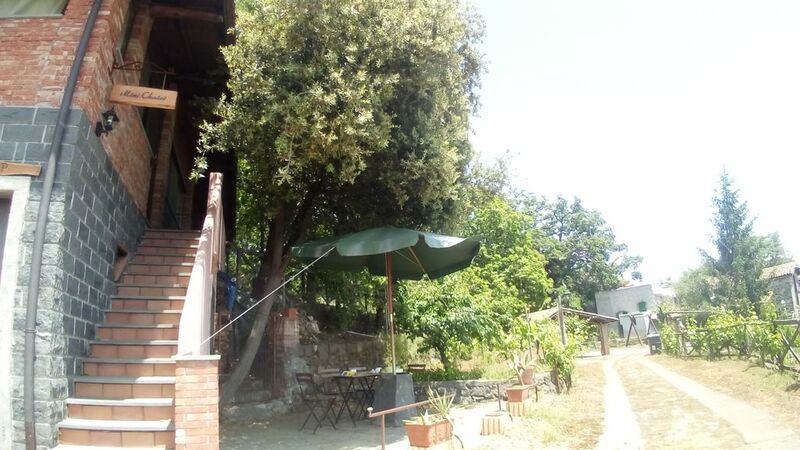 The chalet is located within a large property, where there are fruit trees, a small vineyard, leafy chestnut trees under which you can stop during your walks. Disseminated among nature there are three holiday homes, each of which has a private outdoor space, and a newly built swimming pool, from which you can enjoy a breathtaking view of both Mount Etna and the coast. There are two large solarium areas equipped with cots and games for children, wifi. Mini chalet is located in Milo, a small Etna village located 750 meters above the sea, each year hosts gastronomic and sports events such as ViniMilo in September, Etna Marathon Mtb, and is rich in restaurants with typical cuisine, is the ideal base for spend a holiday of hiking and skiing on Etna, relaxation, culture and historical cities, going to discover the beauties of Eastern Sicily such as Taormina, Naxos, Le Gole, Catania, Syracuse. We will be happy to offer our guests a bio wine of our production and we provide upon request high chair and cot with a small additional cost per night. -Mini chalet is located on the slopes of Etna, among the majestic chestnut trees, a short distance from Catania and the beautiful Taormina. It consists of a kitchenette, living room / dining room, bathroom, sleeping area, laundry and free indoor parking. It is furnished and equipped, equipped with various appliances (TV, washing machine, fridge, air conditioning, pots and pans, etc.). The chalet also has a courtyard equipped for outdoor dining. Mini chalet is located in Milo, a small Etna village located 750 meters above the sea, each year gastronomy hosts and sports events such as ViniMilo in September, Etna Marathon Mtb, a holiday of hiking and skiing on Etna, relaxation, culture and historical cities, going to discover the beauties of Eastern Sicily such as Taormina, Naxos, Le Gorges, Catania, Syracuse. We will be happy to offer our guests a bio wine of our own production and we will provide a high cost for a night. They are made on demand (by adding a small charge) horse riding or walking in the "trazzere", ancient Sicilian streets and paths that lead to Etna.